This small stash pouch can be used for a multitude of things. 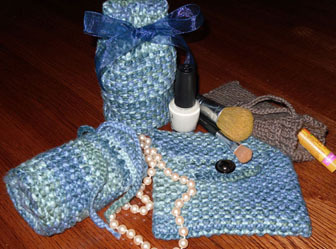 It's fast to knit up and therefore makes a great last minute gift for anyone, or even a gift bag. Since it takes only about half or less of an average skein of yarn, it's a good stash buster too. The directions are for a bag with a round bottom. However, you can create a flat bag by omitting the bottom and just seam up the edges. Each side looks good and is different from the other, so you can decide which you would like to use as your outer side. 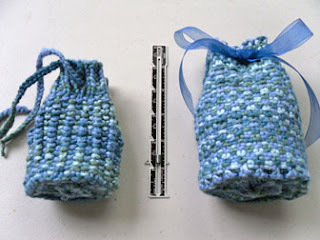 If you would like a larger bag, just increase the number of stitches by multiples of 10, and make as long as you want. Needles - size 8 straight or circular (any length), and size 8 DPs. Note - you can use whatever size needle works best with your yarn. I chose this size with the yarn I used, in order to get a tight stitch. Yarn - Worsted weight, approximately 32 grms in cotton weight, or 40 yds in any worsted weight yarn. I used Patons Pure 100% Organic Cotton. Yarn needle or other blunt tipped needle.